Work is underway at the site of Meow Wolf’s future Denver home, slated to open sometime in 2020. 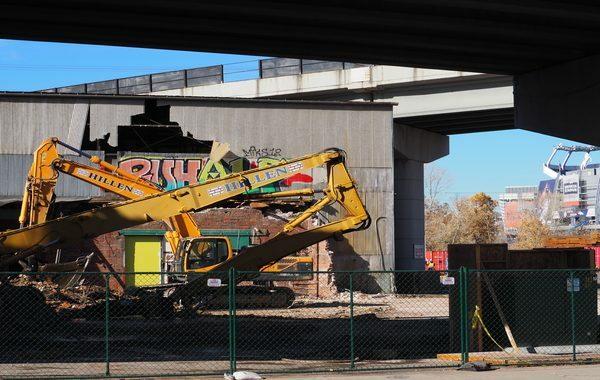 In recent days, crews began demolishing the building at 1338 1st St., which is partially hidden by the maze of viaducts that form the Interstate 25-Colfax Avenue interchange. The building previously housed human resources operations for amusement park Elitch Gardens, which is just north of the property. 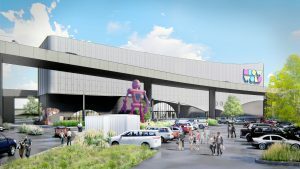 Meow Wolf, a tourist attraction in Santa Fe that has described itself as an “immersive art experience,” announced in January that it would open at the site, which is in the Sun Valley neighborhood. A five-story, 90,000-square-foot building is slated to be built at the site. The triangular structure will rise above the viaducts. Denver-based Revesco Properties, a co-owner of Elitch Gardens, is developing the project. Meow Wolf previously said it is paying Revesco $60 million to lease the building and surrounding 3.75-acre site — much of which will be used for parking — for 20 years. In addition to 60,000 square feet of exhibit space, the building is also slated to include an event venue, cafe and bar, and gift shop. Turner Construction is the general contractor and Shears Adkins Rockmore is the architect. In January, Meow Wolf began selling $1,000 tickets for Denver’s to-be-determined opening night. As of Thursday, it had sold 29 of 1,000, according to its website. The company also has sold 1,300 of 20,000 tickets for later in its first week; those retail for $50. After the first week, general admission tickets will cost $25, according to the website. Meow Wolf also plans to open an attraction in Las Vegas.